If you’ve been following DJI of late, that’s a question you’ve probably asked yourself. I know I have. DJI’s last four drones didn’t even exist on the market at this time last year. And then, within the space of a few months, they launched the entry-level Tello, surprised us with the light and portable Spark, and got down to serious business with the Mavic Pro Platinum. But it’s their latest release – the Mavic Air – that is really making heads turn. And it’s barely days into its launch! It got me curious. These are happening times for aerial photography, and I wouldn’t blame drone manufacturers for trying to cash in on the craze. So what kind of a drone is the Mavic Air? Is it mostly flash and parlor tricks, or can you use it for serious photography and videography? I really hoped it would be the latter, and thankfully, it is. With this tiny yet powerful new drone camera, DJI has just set another benchmark for excellence – just like they did with their Phantom and Inspire series (I still use some of them), and with their first line-up of Mavic drones. Magically Mavic – Only Even Better! For all its brilliance and innovative design, the Mavic Air doesn’t reinvent the wheel. And that’s what I like best about the world’s most portable drone camera. It retains a lot of what we loved about its predecessors – in particular, the DJI Spark and the DJI Mavic Pro Platinum. But I’ll get to detailed comparisons a bit later in this post. First, let me introduce you to the DJI Mavic Air, and what it’s capable of doing. This little drone scores big on design and aesthetics. DJI complements its sleek lines and sturdy build with high-quality finishes (and plenty of color choices for those of you who’re into that). But I can’t talk about the Mavic Air’s design without raving about its portability; so here goes. If you think the Spark is a portable drone, the Mavic Air will have you thinking again. 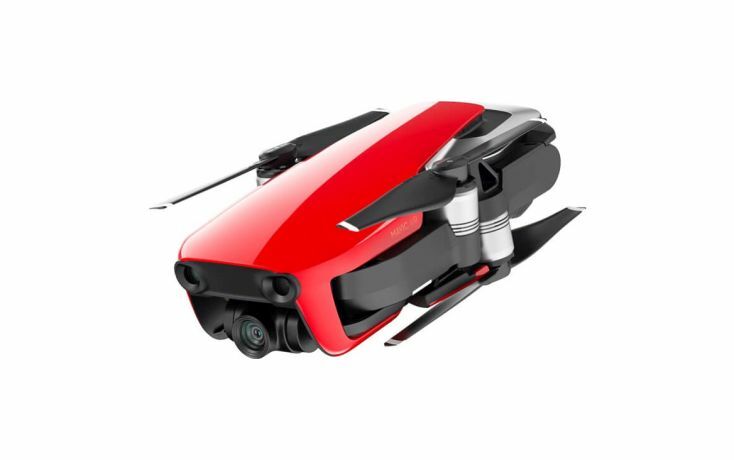 It borrows its foldable design from the Mavic Pro & Pro Platinum drones, but gets into ‘Spark’ territory when it comes to size. 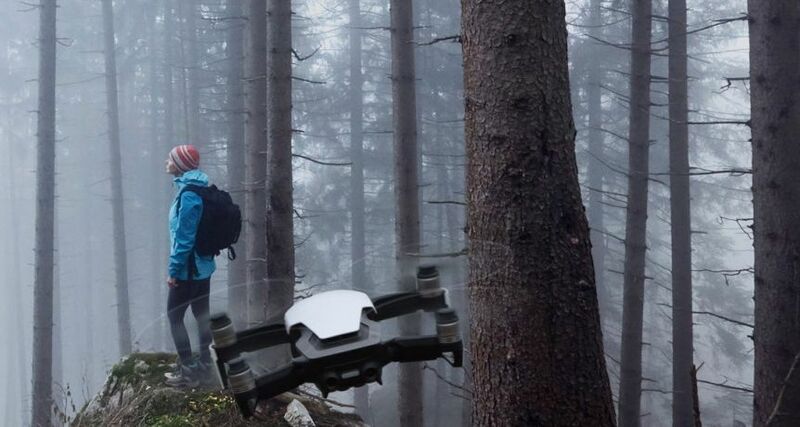 Together, the size and the folding mechanism make the Mavic Air an extremely handy little device that you can fold up into a smartphone-sized object and carry in your pocket or stash in your backpack. Unlike the Spark, it doesn’t even need a dedicated carrying case to protect it in transit. The camera and gimbal on this drone are nicely shielded so you don’t need to worry about them – something I missed sorely in the Mavic Pro. What’s more, the same attention to detail can be seen in the design of the peripherals that accompany the Mavic Air. Even the thumb sticks on its controller are hidden away in little storage niches at both ends, just below the arms you fit your smartphone into. This gives the remote a clean profile and makes it possible for you to store it in the Air’s carry-bag itself. In my opinion, the second biggest USP of the Mavic Air (after its portability) is its 3-axis stabilization. This makes it a significant upgrade from the Spark, which has a 2-axis gimbal. And it places it on par with the Mavic Pro and Mavic Pro Platinum drones, which also come with 3-axis stabilization gimbals. I’m impressed by how the Air has managed to combine the best of both worlds – the Spark’s onus on portability, and the superior footage quality of the Mavic Pro series. In fact, in terms of numbers, the Mavic Air even manages to come out slightly ahead of the Mavic Pro and Pro Platinum. You can shoot 4K video on the Air at up to 30fps, and at a bitrate of up to 100Mbps. Compare this with the Mavic Pro’s bitrate of 60Mbps, and you’ll see that the Air actually offers crisper footage with more data packed into each frame. You can also use it for shooting slow motion videos at 120fps and 1080p resolution. And it has a 12MP camera for still images as well, though I’d say that because of its 3-axis stabilization, videos are the Mavic Air’s strong suit. Speaking of sensors, the camera on this new drone has the same sensor size as the Spark and the Pro. If your line of work involves capturing sweeping landscapes or cityscapes with an enormous range of light and dark tones, you might be better off with the larger sensor that the Phantom 4 has. This doesn’t take anything away from the Mavic Air though; it’s a different kind of beast, and it outshines all the other models in DJI’s Mavic lineup. The Mavic Air is easy to control. You have three options – using its accompanying remote control (which they’re calling a ‘wired’ connection for some strange reason! ), pairing it with your smartphone over Wi-Fi, or summoning your inner Jedi by using the SmartCapture mode, which only relies on hand gestures. DJI has also equipped the Mavic Air with a sophisticated piece of flight assistance technology, which they call Advanced Pilot Assistance System (APAS). The APAS enables the Air to detect obstacles in its flight path, and actually fly around or over them instead of coming to a stop like its predecessors. It’s a cool feature and gives you uninterrupted footage, but it does take some getting used to, especially if you like to have the final say in every little twist and turn that your drone makes. For those of you who like shooting pre-sets, the Mavic Air offers six of them – Asteroid, Boomerang, Rocket, Dronie, Circle, and Helix. The Asteroid mode is particularly cool, and I’d probably use that even though pre-set modes aren’t my thing. In terms of battery life, the Mavic Air sits somewhere between the Spark and the Mavic Pro. It has a maximum flight time of 21 minutes, as compared to the Spark’s 16 and the Mavic Pro’s 27 (30, if you’re using a Pro Platinum). Though I love the Mavic Pro Platinum for its extended flight time, the compromise that the Mavic Air asks for is one that I’d be willing to make in exchange for everything else that it offers. A spare battery for this new drone will cost you about $80, which is a few bucks less than getting one for the Pro or Pro Platinum. In terms of speed, the Mavic Air is comparable with the Mavic Pro and Pro Platinum, maybe even a bit quicker (42mph against the Pro’s 40mph). It’s definitely faster than the Spark’s maximum speed of 31mph. What that means is you can use it in moderately windy conditions without risking the quality of your footage. Like with its flight time, the Mavic Air’s price also offers a middle ground between the Spark and the Mavic Pro. It currently costs $800, which is $200 less than the Mavic Pro, and $300 less than the Pro Platinum. The Spark, at $500, is much cheaper but it comes nowhere close to the Mavic Air’s design and footage quality. To me, the choice between these three is clear. But I’ll let you be the judge of that. Let’s actually move on to some serious comparisons. Choosing Your DJI Drone – Tello, Spark, Mavic Air, or Mavic Pro? I’ll pit the Mavic Air against three other drones – the Tello, the Spark, and the Mavic Pro/Pro Platinum. I’ll even go so far as to say that there’s never an objective choice between these drones. Each has its own USPs, which is what I’ll talk about first. And I’ll close the post with a side-by-side comparison chart for added measure. The DJI Tello is an inexpensive drone. It’s also tiny, weighing just 80 grams. DJI has built this micro drone for basic, indoor work, and has equipped it with decent specs. It can record 720-resolution videos at up to 30fps, and 5MP still images. Stabilization on this drone is electronic, and you control it with your smartphone, which also directly receives all the recorded footage. Someone looking for quick flying lessons can pair the Tello with an external controller as well, and rest assured that it can survive a few crashes. A crash-resistant micro drone perfect for practice before you move on to bigger drones. A pocket-friendly piece of gear, costing just $100 (without a controller). Decent stabilization, sensors, and flight time (13 minutes) for a drone this size. Simple controls using your smartphone. The DJI Tello can only go up to 100m (30ft), limiting it to indoor work. Footage quality, which is poor for both videos and images, as is expected for this class of drones. A bundled controller. The Tello is controlled using your smartphone, which isn’t ideal. When you’re looking for a DJI drone that captures decent footage, the Spark is the lowest you can go. I mentioned earlier that this one has a 2-axis gimbal, which isn’t ideal. Nonetheless, it gets you passable 1080/30p videos at 24Mbps. It captures 12MP still images, but only in JPEG mode. You can use it in mildly windy conditions, and carry it around pretty easily. The Spark’s battery lasts up to a maximum of 16 minutes, and it has an in-built obstacle avoidance feature. A small, lightweight, and portable drone. Decent photo and video quality. Flying options including a controller, your phone, and hand gestures. Affordable price-point (for the drone and its spare batteries). Advanced stabilization. The Spark only has a 2-axis gimbal. Image editing options. The Spark doesn’t shoot RAW images. Video recording options. The Spark is limited to shooting 1080/30p only. Flight time, which is limited to 16 minutes (maximum) for the Spark. I don’t need to repeat everything that I’ve already written about the Mavic Air. I’ll just sum up by saying that this little drone packs a punch in terms of the features it offers at its price point. You get 4K videos and 12MP images, along with 3-axis stabilization, and an advanced pilot assistance system. This one shoots RAW images as well, and offers a bunch of cool video shooting presets. Its flight speed, range, and endurance are all decent, and it completely aces the game in terms of portability. An ultra-lightweight and portable drone. Sturdy build, with a well-protected camera and gimbal. 4K video shooting capabilities, with a 100Mbps bitrate. 12MP still images in both JPEG and RAW formats. Multiple collision avoidance sensors and advanced pilot assist system. Well-designed controller, with additional options to control the drone via your phone or hand gestures. The extended flight time of the Mavic Pro (the Air is limited to 21 minutes). The high climb rate of the Mavic Pro (the Air is limited to 9.8ft/s). Resistance to radio interference. The Air connects using Wi-Fi, which other connections can interfere with. The Mavic Pro has found serious competition in the Mavic Air, but if you already own one, you don’t really need to get the Air. Especially if you’re not into those levels of portability. The Mavic Pro, in its defense, is still fairly easy to carry. It weighs only 1.8kg and folds up to fit easily in your camera bag. It shoots videos in 4K/30p, though its 60Mbps bitrate isn’t ideal. You get editable images in RAW format, high-definition panoramic shots, and unbeatable endurance. The Mavic Pro has a max flight time of 27 minutes, and the Pro Platinum even goes up to 30 minutes. These drones also have unmatched climb rates of 16.4ft/s. I’ll sum up their pros and cons below. Excellent endurance of 27 minutes and 30 minutes for the Pro and Pro Platinum respectively. High climb rate of 16.4ft/s (the Mavic Air is limited to 9.8ft/s). 4K/30p videos, with cinematic DCI resolution on the Platinum model. 28mm focal, as opposed to the wide-angle lenses of most other drones. OccuSync radio transmission, leading to better range and radio interference resistance. High definition panoramas, enabled by 90-degree roll axis rotation. The Pro and Pro Platinum shoot 4K at 60Mbps, which leads to bad compression artifacts. Advanced collision sensors. The Pro and Pro Platinum only have forward collision sensors, unlike the Mavic Air. The unmatched portability of the Mavic Air. So how do these drones line up against each other? Check it out in the table below. Which of these will be your next drone? As I said before, the choice is always subjective. But I will add that with the Mavic Air, DJI has bridged the gap between gear that caters to professionals, and gear that is mostly built for ‘hobbyists’. The Air will serve you well if you’re looking for serious photo or video work. But if you’ve only just got yourself a Mavic Pro or Pro Platinum, you needn’t shell out $800 for a Mavic Air just yet – unless you’re as smitten by its design as I am!